«Polidoro is not just a good investigator, he's also a good story teller - he really makes these investigations sound interesting and even exciting at times. Even if you aren't already interested in this subject, it's unlikely that you will be bored by Polidoro's prose - and if you are interested, there's quite a lot here that you'll enjoy reading». Are poltergeists real? Can an Indian fakir really stop his heartbeat? Can individuals bend metal and see through solid objects? Are some people literally “human magnets”? Internationally recognized author, journalist, lecturer, and paranormal investigator Massimo Polidoro began his study of such paranormal questions at an early age. 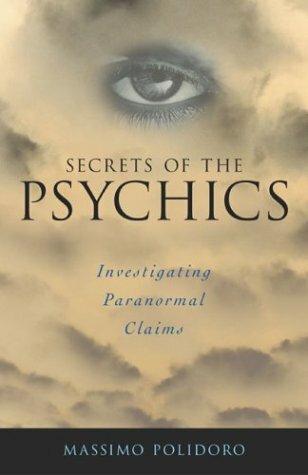 In Secrets of the Psychics, he uses his more than fifteen years of experience in investigating extraordinary claims by examining dozens of supposedly paranormal events, some of them famous historical incidents, others contemporary claims of psychics, mediums, healers, “human magnets,” a “girl with X-ray eyes,” and more. This fascinating book presents in-depth discussions of the claims and the evidence for each individual case. Polidoro first explores the psychology of psychic deception in “It’s All in the Mind” and “When I Was a Psychic . . . for an Hour.” He then turns to historical events, including “Eusapia’s Sapient Foot,” a new examination of the Feilding Report, the most valued account of séances performed by this famous medium; “The Case of Anna Eva Fay: The Medium Who Baffled Sir William Crookes”; “Houdini and Conan Doyle: The Story of a Strange Friendship”; “Houdini versus Margery: When the Magician Met the Blond Witch of Lime Street”; and other fascinating cases. Investigating contemporary paranormal claimants, Polidoro reveals the “Secrets of a Russian Psychic,” carefully examines a demonstration of cold reading in “Roll Up for the Mystery Tour,” considers the evidence for some modern-day miracles in “The Miraculous Oil Inside a Glass Tube,” exposes the tricks of Indian gurus in “Secrets of Indian God-Men,” and pursues other claims alleging supernatural phenomena. This intriguing examination of the bizarre and the strange by a top-notch investigator will delight both skeptics and believers alike. “Those days in Los Angeles represented my initiation into the scientific investigation of claims of the paranormal; a practice that, sometimes, inevitably became what Carl Sagan aptly called the ‘fine art of baloney detection.’ I spent over a year in the United States studying and working with [James] Randi, then returned to Italy. There I worked to have the Italian Committee for the Investigation of Claims of the Paranormal (CICAP) grow while I studied to earn a degree in psychology. During those years, I also led dozens of other investigations and experiments on paranormal claims (most of which are collected in the fifteen books I have published so far in Italy).